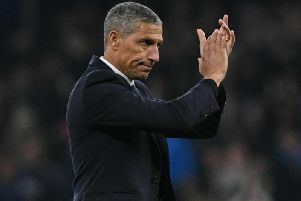 Chris Hughton wants Brighton to continue their good form and take it into the crunch Premier League clash with Swansea at the end of the month. The Seagulls are unbeaten in four games ahead of tomorrow' FA Cup fifth round tie at the Amex against Coventry. With 11 Premier League games to go, Albion are 14th but just two points ahead of third-from-bottom Southampton and Hughton said: "We've been in good form. A home win in this division and two draws away from home is regarded for a club like ourselves as good form. "Add on top of that, the cup win against Middlesbrough and another cup tie on Saturday and what we'd want to do is go into the Swansea game in good form and having not picked up any injuries. "It's going to be tight for a big group of teams going into those 11 games and it will be about the team that is able to get the most wins, score the most goals and show that little bit more confidence than anybody else."